Parents are irate with the Beaver Ridge Elementary School in Norcross, Georgia. 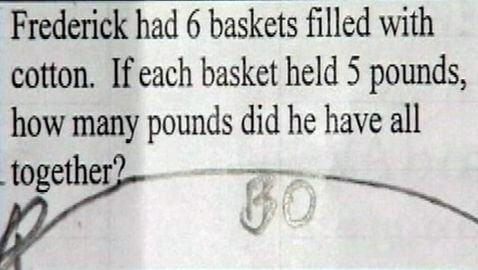 It has been reported that students were given math worksheets that had problems containing examples of slavery in them. The word problems on the worksheets have references to slavery and beatings. Sloan Roach, a spokesperson for the district, said that the teachers were hoping to incorporate social studies lessons within the math problems as part of ‘cross-curricular’ activities. Roach also said that even though the questions were inappropriate, she does not feel that the teachers were trying to harm the students with the questions. “This is simply a case of creating a bad question,” Roach said. One parent, Terrance Barnett, said that explaining the question to his child was painful.